A couple takes a close look at some of the exhibits at the Bridal Show 2013 at the Sri Lanka Exhibition and Convention Centre. The exhibition concludes today. The crisis in certain financial institutions has snowballed into a larger issue with many banks and lending institutions unable to maintain liquidity levels. The crisis has again triggered panic among depositors. The crisis in some financial institutions surfaced again with the problem at Central Investments and Finance Company PLC (CIFL), which is now under a new management appointed by the Central Bank. 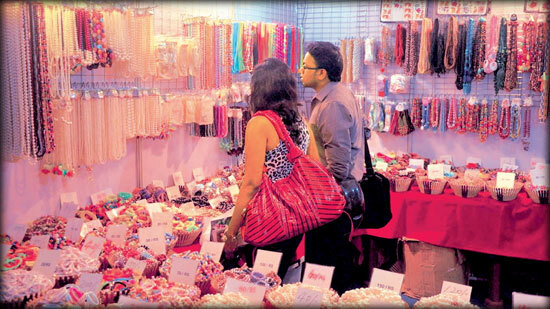 Sri Lankan exporters have hailed the proposed China-Sri Lanka Free Trade Agreement (FTA) and expect big opportunities to expand and diversify their export markets. Selected Sri Lankan items could be exported to China at zero duty with the implementation of the FTA in November. There is a conducive environment for foreign investments in Sri Lanka. The World Bank (WB) has ranked Sri Lanka at second place out of 144 countries which are suitable for investment.Compared to last year, the flow of investments to the country from January to June has increased by 20 percent. The fruit and vegetable processing and export industry earned US$ 32.5 million in 2012 due to the untiring efforts of the members of the Association, said Export Development Board, Chairman, Bandula Egodage.. Egodage was speaking at the 32nd AGM of the Lanka Fruit and Vegetable Producers, Processors and Exporters Association on Wednesday. Ceylinco Life will award 160 scholarships to young Sri Lankans under the 13th Ceylinco Life Pranama scholarship program in February next year. A company official last week said that its 247 branches islandwide have begun accepting applications from those eligible to be rewarded under the four-tiered scholarship scheme which recognises academic and extra-curricular achievement. Milcris, the Sri Lankan construction management consultancy company based in Oman is now eyeing major local projects as the construction sector in the country is booming with mega infrastructure, hotels and casino projects in the pipeline.